Twenty-one year old Brandon Finnegan put his name on the map in Tuesday night’s epic wildcard game, when he tossed scoreless 10th and 11th innings before leading off the 12th with a walk to Josh Reddick, who would eventually come around to score against Jason Frasor. Drafted by the Royals with this year’s 17th overall pick, Finnegan made quick work of the minor leagues, making his big league debut on September 6th at Yankee Stadium, just 81 days — and 27 minor league innings — removed from his last appearance with TCU in this year’s College World Series. To find comps for Finnegan, I first looked for pitchers with a similar arsenal of pitches. Using a minimum of 1,000 pitches, I sought out left-handed pitchers who threw fastballs, sliders, and changeups — Finnegan’s three pitches — at least 90% of the time since 2008, and threw each of these pitches at least 5% of the time. From there, I turned to the PITCHf/x database to find out how often these pitchers’ pitches fell within Finnegan’s middle 50% of values for velocity, break angle, break length, and spin rate, and spin direction from his eight big-league games. These are the pitchers who threw the highest ratio of pitches comparable to what Finnegan threw. The similarity percentage was calculated by dividing each pitcher’s share of pitches meeting these criteria by the share of pitches met by Finnegan himself. The ERA’s were calculated over the last seven years: 2008-2014. Finnegan looks to have a bright future ahead of him, as his top two comps are two of the most dominant pitchers in baseball — one a starter (Sale) and one a reliever (Watson). It remains to be seen which path the Royals will choose for their hard-throwing lefty going forward. While it’s tempting to slot him in in a relief role next season, the wiser decision might be to stretch him out as starter, where he would be able to take full advantage of his three-pitch arsenal. But either way, until the Royals’ playoff run comes to an end, Brandon Finnegan will be allowed to air it out for just an inning or two at a time on easily the biggest stage he’s ever seen. And given his lights-out stuff, he might just end up being this year’s Francisco Rodriguez. This article originally appeared on Pinstripe Pundits. It’s been quite a week for the WAR stat. Since Jeff Passan dropped his highly controversial piece on the metric on Sunday night, the interwebs have been abuzz with arguments both for and against the all-encompassing value stat. One criticism in particular that caught my eye came from Mike Newman, who writes for ROTOscouting. Newman’s qualm had to do with a piece of WAR that’s often taken for granted: the positional adjustment. He made the argument that current WAR models underrate players who play premium defensive positions, pointing out that it would “laughable” for Jason Heyward to replace Andrelton Simmons at shortstop, but not at all hard to envision Simmons being an excellent right fielder. This got me thinking about positional adjustments. Newman’s certainly right to question them, as they’re a pretty big piece of the WAR stat, and one most of us seem to take for granted. Plus, as far as I’m aware, none of the major baseball websites regularly update the amount they credit (or debit) a player for playing a certain position. They just keep the values constant over time. I’m sure that whoever created these adjustments took steps to ensure they accurately represented the value of a player’s position, but maybe they’ve since gone stale. It’s certainly not hard to imagine that the landscape of talent distribution by position may have changed over time. For example, perhaps the “true” replacement level for shortstops is much different than it was a decade or so ago when Alex Rodriguez Derek Jeter, Nomar Garciaparra, and Miguel Tejada were all in their primes. I decided to try and figure out if something like this might be happening. If the current positional adjustments were in fact inaccurately misrepresenting replacement level at certain positions, we’d expect the number of players above replacement level to vary by position. For example, there might be something like 50 above-replacement third basemen, but only 35 shortstops. Luckily, the FanGraphs leaderboard gives you the ability to query player stats by position played, which proved especially useful for what I was trying to do. For each position, I counted the number of plate appearances accumulated by players with a positive WAR and then divided that number by the total plate appearances logged at that position. Here are the results broken out by position for all games since 2002. Based on this data, it seems like the opposite of Newman’s hypothesis may be true. A significantly higher portion positive WAR plate appearances have come from players at the tougher end of the defensive spectrum, which implies that teams don’t have too difficult of a time finding shortstops and center fielders who are capable of logging WARs above zero. Less than 13% of all SS and CF plate appearances have gone to sub-replacement players. But finding a replacement-level designated hitter seems to be slightly more difficult, as teams have filled their DH with sub-replacement-level players nearly 30% of the time. Either teams are really bad at finding DH types (or at putting them in the lineup), or the positional adjustments aren’t quite right. The disparities are even more pronounced when you look at what’s taken place from 2002 to 2014. The share of PAs logged by shortstops and center fielders hasn’t changed much over the years, but the numbers have plummeted for first basemen, corner outfielders, and DH’s. From Billy Butler and Eric Hosmer, to Jay Bruce and Domonic Brown, this year’s lineups have been riddled with sub-replacement hitters manning positions at the lower end of the defensive spectrum. Meanwhile, even low-end shortstops and center fielders, like Derek Jeter and Austin Jackson, have managed to clear the replacement level hurdle this season if we only count games at their primary positions. 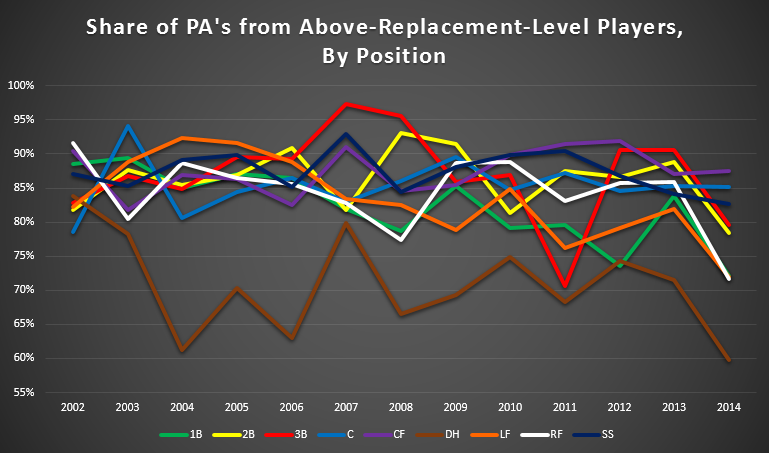 The waning share of above-replacement PA’s coming from 1B, LF, RF, and DH has caused the overall share to drop as well, with a particularly big drop coming this year. Here’s a look at the overall trend. Frankly I’m not sure what to make of all of this. I’m hesitant to call it evidence that the positional adjustments are broken. There could be some obvious flaw to my methodology that I’m not considering, but I find it extremely interesting that there’s been such a shift between this year and last. 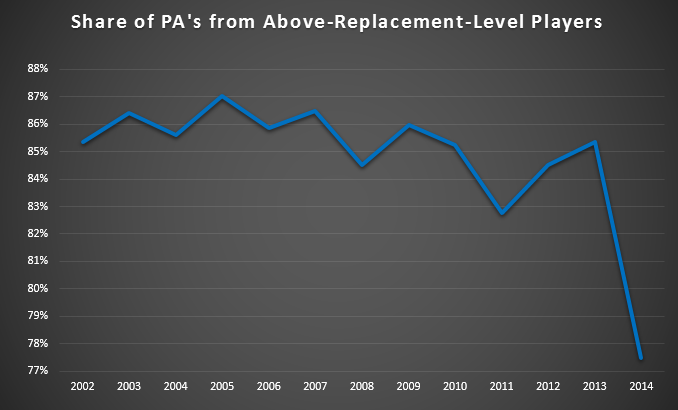 We’re talking an 8 percentage point jump in the number of PAs that have gone to sub-replacement-level players. 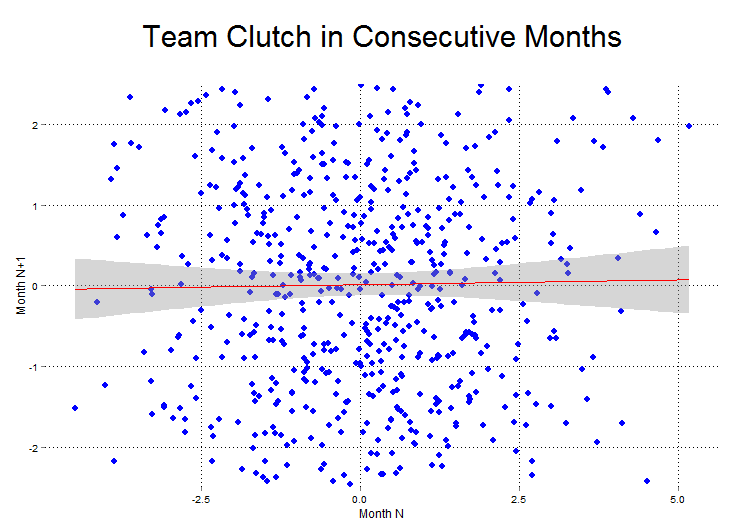 Maybe its been spurred the rise of the shift or maybe year-round interleague play has something to do with it, but it seems to me that something’s going on here. And I’m interested to hear other people’s thoughts on these trends. Rockies outfielder Corey Dickerson is quietly having an excellent season at the plate. Believe it or not, the 25-year-old is hitting an impressive .315/.371/.577, which even after adjusting for the effects of Coors Field, is still good for a 144 wRC+ — 13th highest among players with at least 400 plate appearances. Dickerson’s batted pretty sparingly against lefties, which has certainly played a role in his gaudy stat line, but platoon or no platoon, a .405 wOBA is certainly nothing to sneeze at. Dickerson’s contact rates tell a similar story. Just like his overall swing rate, Dickerson’s contact rate of 81% isn’t all that interesting. Here, he checks in at 151 out of 251. 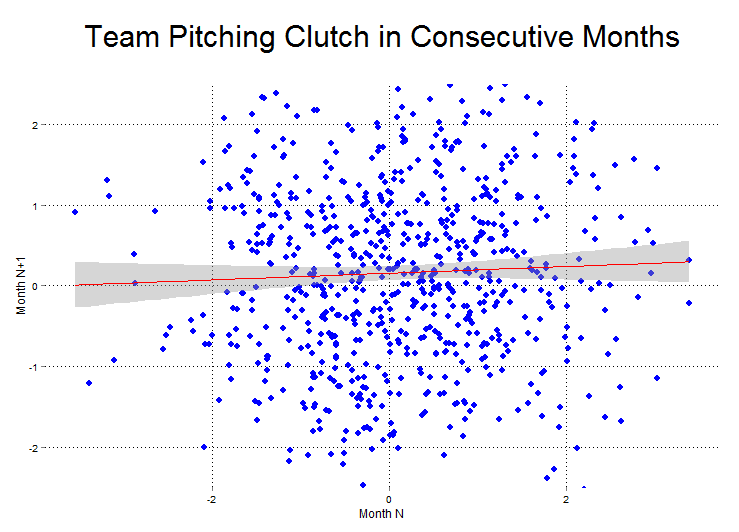 But also like his swing rate, it doesn’t change very much depending on a pitch’s location. He’s put wood on 83% of pitches he’s offered at in the zone, compared to 74% outside of it, making him 1.1 times as likely to connect on a pitch within the zone — fourth lowest out of 251. Multiplying these two metrics (Contact% x Swing%) gives us Dickerson’s contact rate over all pitches seen, regardless of that pitch’s location. Lets call this AllContact% to distinguish it from the traditional Contact%. This number shows just how much of an outlier he really is. For the average major league hitter, a pitch thrown in the strike zone results in contact 2.9 times as often as one outside of it, but for Dickerson, a pitch in the zone is less than 1.7 times as likely. Even if we set the bar as low as 70 plate appearances to include 577 players, this is still the lowest in baseball since the start of 2013. And unsurprisingly, he also the all-time leader since 2007 (the earliest year with PITCHf/x data). Dickerson had the lowest among all players with 100 PA’s here, but I set the threshold to 600 PA’s to avoid having leader board filled with obscure players like Jesus Feliciano and Jordan Brown. In case you were wondering, Vladimir Guerrero checked in at 2.13. Dickerson’s indifference to a pitch’s location means its probably only a matter of time before pitchers just stop throwing the ball in the strike zone, especially if he keeps slugging well above .500. So far this year, opposing pitchers have thrown Dickerson a strike just over 45% of the time. This is lower than the league average of 49%, but isn’t exceptionally low, especially for a free-swinging power hitter. Guys like Jose Abreu, Carlos Gomez, and Pablo Sandoval see strikes around 42% of the time, so pitchers could almost certainly get away with throwing Dickerson a few more balls. Sure, he’s shown that he’s able to hit those pitches, but even for a player like Dickerson, chasing after bad pitches is still a recipe for lots of swings and misses. His 74% O-Contact% is well above the league average of 63%, yet still lower than the overall Contact% of 80%. Dickerson’s one-size-fits-all approach to swinging has worked well so far, but it remains to be seen what will happen when pitchers start exploiting it by throwing more balls out of the zone. Maybe he’ll be unfazed and keep on raking. Maybe he’ll turn into a strikeout machine, who needs to refine his approach to even stay in the big leagues. Either way, Corey Dickerson’s a fascinating player, who’s unlike any we’ve seen in recent years, and it’ll be interesting to see if he’s able to keep succeeding going forward. At the start of the 2013 season, Brett Gardner adopted a new, more aggressive approach at the plate in the hopes of barreling more hittable pitches. Up to that point, the slap-hitting outfielder had been one of the most patient hitters in baseball. Gardner sat out most of 2012 due to injury, but swung at just 32.7% of all pitches seen between 2010 and 2011, the fewest of any player with at least 300 plate appearances. Last year, his swing rate jumped to 40.1%, with most of his new-found aggressiveness focused on pitches located within the strike zone. 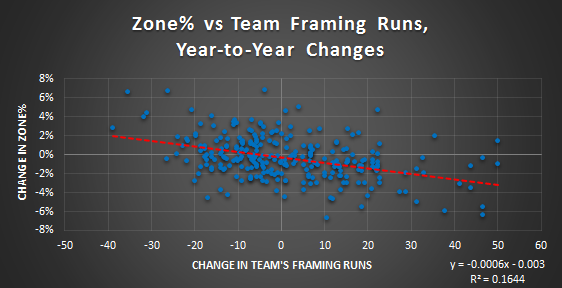 While his zone swing rate rose by 13 percentage points from 2010 to 2013, his rate for pitches out of the zone only increased by seven. The change seemed to pay off. Gardner posted a career high .143 ISO last season — much better than his career mark of .103 — on his way to a very respectable 108 wRC+. He’s carried that success over to this season as well. With 16 homers, he’s doubled his total from last season — which was already a career high — and with a 119 wRC+, he’s developed into one of the better-hitting outfielders in all of baseball. But unlike last season, he’s no longer sporting a swing percentage north of 40%. Instead, it’s fallen back to 36.6%, just a tad higher than his 35% mark from 2011. So if Gardner’s back to his old ways of watching two thirds of all pitches go by, how has he managed to keep hitting for power? The answer has everything to do with plate discipline. Gardner’s continued to take advantage of hittable pitches, but has also gotten much better at laying off pitches outside of the strike zone. First lets look at how often he’s swung at pitches inside of the strike zone. Since adopting his more aggressive approach two springs ago, Gardner’s behavior on pitches in the zone hasn’t changed much. Maybe he’s gotten a little less aggressive over the past couple of years, but for the most part, his swing rates have been pretty consistent. It’s probably safe to say that Gardner’s a guy who swings at about 50-55% of pitches in the strike zone. We see a different story, however, when it comes to pitches outside of the zone. At least initially, Gardner’s swing rate on balls out of the zone also spiked. He seemingly became more aggressive on all pitches, without discriminating based on location. But that’s changed over the past couple of seasons, as he’s swung at fewer and fewer pitches out of the zone. His O-Swing% dipped below 18% in both July and August — down from around 25% in early 2013 — putting him on par with what he was doing back in 2010 and 2011. Today, Gardner’s been nearly three times more likely to swing at a strike than a ball, up from two times as likely in April of 2013. Gardner’s improved plate discipline is nothing new. Although his change in approach puts a kink in the trend, Gardner’s been getting better at deciding whether or not to swing since his first days in the big leagues, and probably even longer. Even before he re-evaluated his approach before the 2013 season, he was already starting to transition from a “guy who doesn’t swing at anything” to a “guy who doesn’t swing at balls”. Coming up through the minors, Gardner didn’t impress many scouts with his tools, and barely even made his college team as a walk-on. Sure, he’s always had plus-plus speed, but that only gets you so far when you’re an outfielder with little power to speak of. Rather than relying on his pure hitting skills, Gardner makes it work with his zen-like plate discipline. By swinging at so few balls out of the zone, Gardner practically forces pitchers to leave the occasional pitch over the heart of the plate, and has just enough pop in his bat to make them pay for it. But most importantly, he’s learned how to take advantage of those mistake pitches, while simultaneously laying off of the bad ones. Brandon Moss has wielded an immensely potent bat since joining the Athletics’ lineup in June of 2012. Between 2012 and 2013, he hit a remarkable 146 wRC+, and clubbed a homer once every 15.7 PA’s, placing him third in baseball behind Chris Davis and Miguel Cabrera over that span. Moss kept up the hot hitting to start the 2014 season, as well. The 30-year-old 1B/OF/DH posted a 162 wRC+ in the season’s first two months, further establishing himself as a key cog in one of baseball’s most potent lineups. But Brandon Moss hasn’t been himself lately. Since his last home run on July 24th, he’s only managed three extra-base hits, resulting in a laughable .168/.317/.198 batting line. 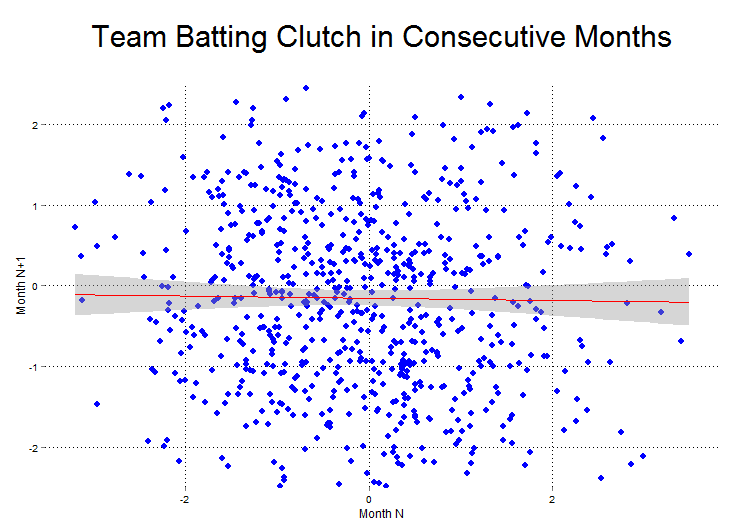 Moss’s slump has also coincided with a change in his hitting approach. Moss appears to have gotten a bit more passive at the plate, swinging at way fewer pitches both inside and outside of the strike zone. This new-found passivity took a turn for the extreme once the calendar turned to August, when his O-Swing% and Z-Swing% fell to 27% and 65%, respectively — both around six percentage points lower than his career norms. Moss’s decision to lay off more pitches has unsurprisingly lead to a spike in both his walk and strikeout numbers, but it’s also resulted in his power completely flat-lining. Moss has basically been Adam Dunn without the power these last couple of months. That’s a pretty terrible hitter, and is part of the reason why the A’s went out and got the real Adam Dunn to help their sputtering offense. The new swing profile is something that’s recently changed, making it the obvious culprit for Moss’s drop-off in production, but we shouldn’t immediately rule out the possibility that pitchers have changed the way they’re approaching him. It could just be that he’s swinging at fewer pitches because he’s getting fewer pitches to hit. That doesn’t seem to be the case, though, as Moss’s zone breakdown from August looks nearly identical to what it was over the season’s first four months. For whatever reason, Moss just isn’t swinging as often as he used to. It’s not entirely clear what’s spurred Moss’ sudden reluctance to swing the bat, but all indications are that it’s done a number on his offensive performance. Unlike the Brandon Moss that — up until recently — could be counted on for a wRC+ north of 130, this latest iteration seems to be letting a few too many hittable pitches float down the heart of the plate. And based on what’s transpired over the last month or two, Moss’s best bet is probably to re-discover the more aggressive approach that’s worked so well for him in the past. Statistics courtesy of FanGraphs; Zone breakdowns courtesy of Baseball Savant. Big-league teams today employ a myriad of data-driven strategies to eek every last drop of value from the players on their rosters. Many of these strategies consist of matching up hitters and pitchers based on their handedness. Between lineup platoons and highly-specialized bullpens, managers today go to great lengths to ensure they’re putting their players in the best possible situation to succeed. It’s easy to see why. With very few exceptions, Major League hitters hit much better against opposite-handed pitching. In terms of wOBA (vs. opposite-handed – vs. same-handed), lefties perform about .031 better against righties, while righties hit .043 better against lefties. Yet not all platoon splits are created equal. Players like Shin-Soo Choo, David Wright, and Jonny Gomes are notorious for their drastic splits, while others put up comparable numbers no matter who’s on the mound. Ichiro Suzuki and Alex Rodriguez are a couple of the no-platoon-split poster boys. Ok, so some batters have bigger platoon splits than others, but is there any particular reason for this? Take Choo for example. Is there something inherent to his skill set or approach that causes him to struggle against lefties? Good hitters or guys who strike out frequently might be a little more prone to having large platoon splits. But for all practical purposes, a player’s ability to hit one type of pitching better than the other seems to be a skill that’s independent of all others. Aside from going by a player’s platoon stats, which can take years to become reliable, there’s little we can do to anticipate which hitters might fare particularly bad against same-handed pitching. And with the exception of players with long track records of unusual platoon splits — like Choo and Ichiro — it’s generally safe to assume that any given hitter’s true-talent platoon split is within shouting distance of the average: .043 for lefties and .031 for righties. Over the last few weeks, I have written a series of posts looking into how a player’s stats, age, and prospect status can be used to predict whether he’ll ever play in the majors. I analyzed hitters in Rookie leagues, Short-Season A, Low-A, High-A, Double-A, and Triple-A using a methodology that I named KATOH (after Yankees prospect Gosuke Katoh), which consists of running a probit regression analysis. In a nutshell, a probit regression tells us how a variety of inputs can predict the probability of an event that has two possible outcomes — such as whether or not a player will make it to the majors. While KATOH technically predicts the likelihood that a player will reach the majors, I’d argue it can also serve as a decent proxy for major league success. If something makes a player more likely to make the majors, there’s a good chance it also makes him more likely to succeed there. After receiving a few requests, I decided to apply the model to players of years past. In what follows, I dive into what KATOH would have said about recent top prospects, look at the highest KATOH scores of the last 20 years, and highlight some instances where KATOH missed the boat on a prospect. If you’re feeling really ambitious, here’s a giant google doc of KATOH scores for all 40,051 player seasons since 1995 ( minimum 100 plate appearances in a short-season league or 200 in full-season ball). Before I delve into the parade of lists, I want to point out one disclaimer to what I’m doing here. KATOH was derived from the performances of historical players, so applying the model to those same players might make it look a little better than it is. Take a player like Jason Stokes for example. Although he was a very well-regarded prospect in the early 2000’s (#15 and #51 per Baseball America in 2003 and 2004), KATOH consistently gave him probabilities in the 70’s and 80’s. But part of that is likely because Stokes’ data points were incorporated into the model. 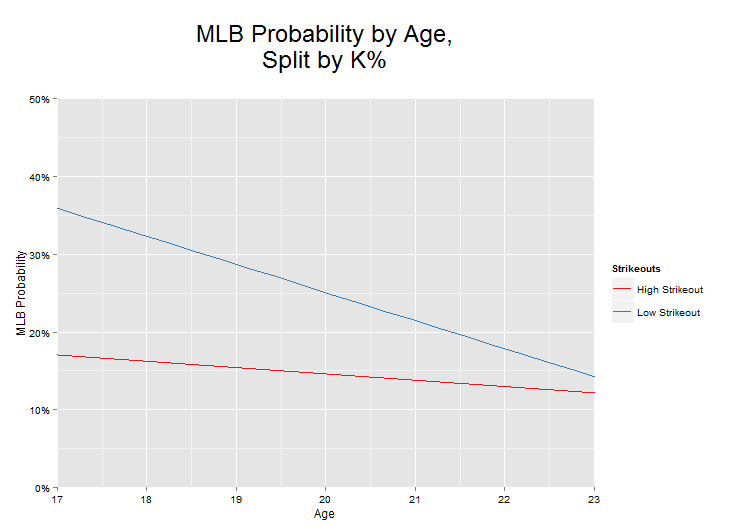 If I had created KATOH in 2005, Stokes’ MLB% may have been a few percentage points higher. Even so, a few data points generally aren’t enough to substantially change a model that incorporates thousands. In other words, it’s probably safe to assume that a player’s MLB% using today’s KATOH is roughly in line with what he would have received at the time. Next, lets take a look at some of the highest KATOH scores of all time, namely those who received a score of at least 99.9%. There aren’t any complete busts among these players, as virtually all of them went on to play in the majors. All of the players who registered a KATOH score of at least 99.9% did so while playing in either Double- or Triple-A. This isn’t all that surprising since these are the levels closest to the big leagues. But what about the lower levels? Like we saw in Double- and Triple-A, there weren’t any complete busts among the highest ranking hitters from full-season A-ball. For both full-season leagues, each of the 20 top ranked players has either made it to the majors, or in the case of Carlos Correa, is young enough to still has an excellent chance to do so. But on the bottom two rungs on the minor league ladder, we come across a few instances where KATOH whiffed, most notably in Garrett Guzman (74%), Richard Stuart (72%), and Pat Manning (72%). Now for KATOH’s biggest whiffs. Looking at seasons prior to 2011, the following players had very high KATOH ratings, but never made it to baseball’s highest level. The biggest miss was Cesar King, a defensive-minded catcher from the Rangers organization. Though to KATOH’s credit, King did spend five days on the Kansas City Royals’ roster in 2001 without getting into a game. Following King are a couple of busted Yankees prospects in Jackson Melian and Eric Duncan. Not to make excuses for KATOH, but these guys’ high scores may have had something to do with the way the Yankees over-hyped their prospects back then. If those two weren’t on Baseball America’s top 100 list, KATOH would have pegged them in the 70’s, rather than in the high-90’s. And here are the major leaguers who KATOH deemed least likely to make it when they were in the minors. Its worth noting that a couple of them — Jorge Sosa and Jason Roach — made it as pitchers. KATOH’s far from perfect, but overall, I think it does a pretty decent job of forecasting which players will make it to the majors. That being said, it’s still a work in progress, and I have a few ideas rolling around in my head to improve on the model. 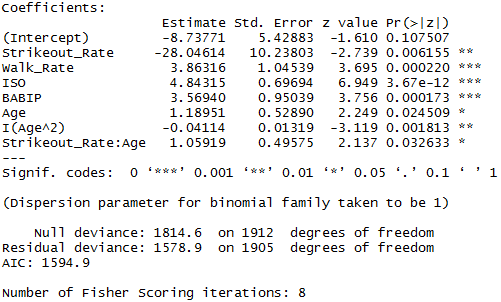 Furthermore, I’m working to develop something that will forecast how a minor leaguer will perform upon reaching the majors, to complement his MLB%. I’ll be dropping these new and improved KATOH projections (for both hitters and pitchers) after this year’s World Series, when we’ll all be desperate for something baseball-related to get us through the winter. Over the last couple of weeks, I’ve been looking into how a player’s stats, age, and prospect status can be used to predict whether he’ll ever play in the majors. So far, I’ve analyzed hitters in Rookie leagues, Low-A, High-A, Double-A and Triple-A using a methodology that I named KATOH (after Yankees prospect Gosuke Katoh), which consists of running a probit regression analysis. In a nutshell, a probit regression tells us how a variety of inputs can predict the probability of an event that has two possible outcomes — such as whether or not a player will make it to the majors. While KATOH technically predicts the likelihood that a player will reach the majors, I’d argue it can also serve as a decent proxy for major league success. If something makes a player more likely to make the majors, there’s a good chance it also makes him more likely to succeed there. For hitters in Low-A and High-A, age, strikeout rate, ISO, BABIP, and whether or not he was deemed a top 100 prospect by Baseball America all played a role in forecasting future success. And walk rate, while not predictive for players in Rookie ball, Low-A, or High-A, added a little bit to the model for Double-A and Triple-A hitters. 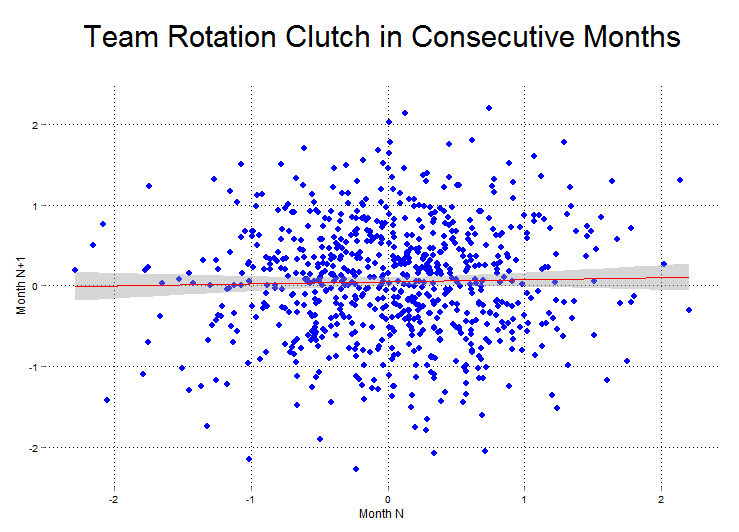 Today, I’ll look into what KATOH has to say about players in Short-Season A-ball. Due to varying offensive environments in different years and leagues, all players’ stats were adjusted to reflect his league’s average for that year. For those interested, here’s the R output based on all players with at least 200 plate appearances in a season in SS A-ball from 1995-2007. As we saw with Rookie league hitters, KATOH doesn’t think any of these players are shoo-ins to make it to the majors. Even Rowan Wick, who hit a Bondsian .378/.475/.815 before getting promoted, gets just 82%. This goes to show that SS A-ball stats just aren’t all that meaningful. Once the season’s over, I’ll re-run everything using the final 2014 stats, which will give us a better sense of which prospects had the most promising years statistically. I also plan to engineer an alternative methodology — to supplement this one — that will take into account how a player performs in the majors, rather than his just getting there. 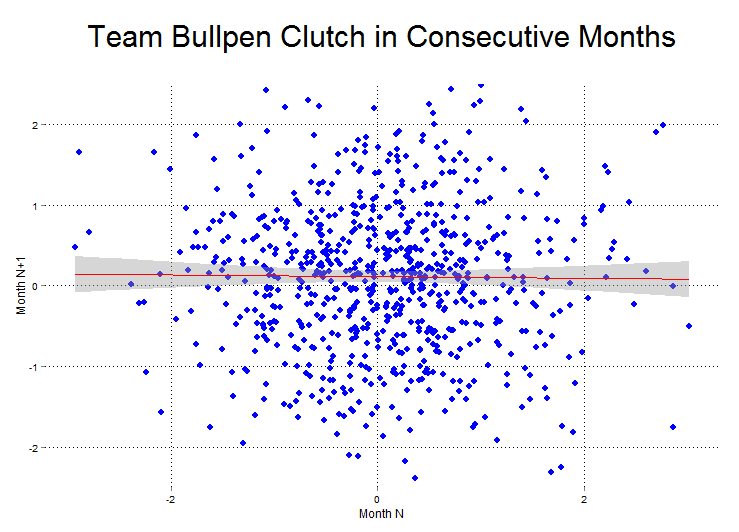 Additionally, I hope to create something similar for projecting pitchers based on their statistical performance. In the meantime, I’ll apply the KATOH model to historical prospects and highlight some of its biggest “hits” and “misses” from years past. Keep an eye out for the next post in the coming days.